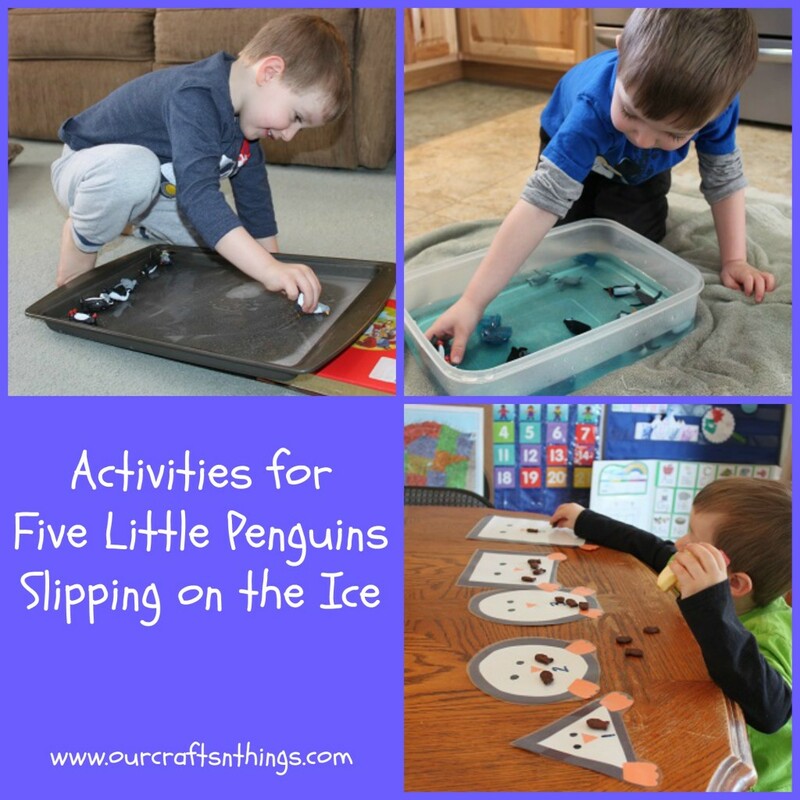 We had a lot of fun reading Five Little Penguins Slipping on the Ice by Steve Metzger and doing some great activities to go along with the story. 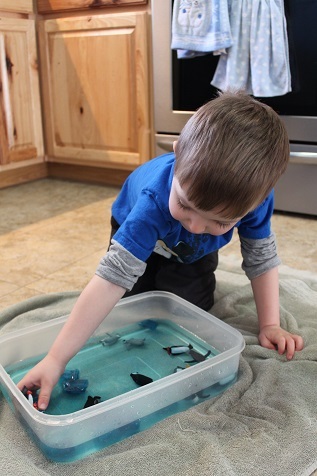 I put out some water and added some blue ice cubes and some penguins. 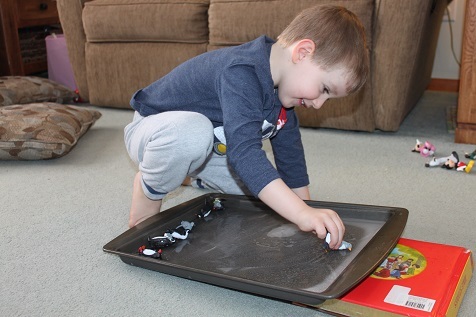 Hunter loved this and played with it for a very long time! I froze some water on a pan so that the penguins could go ice skating. 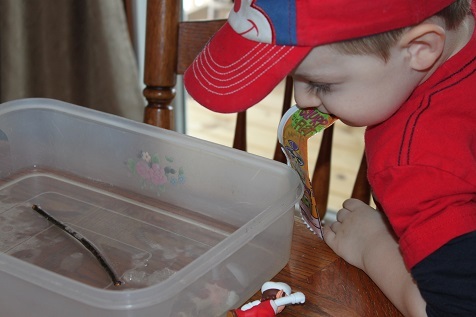 Hunter didn’t care for this activity too much at first, but once he got into it he really enjoyed it. He even requested to play with it again later. 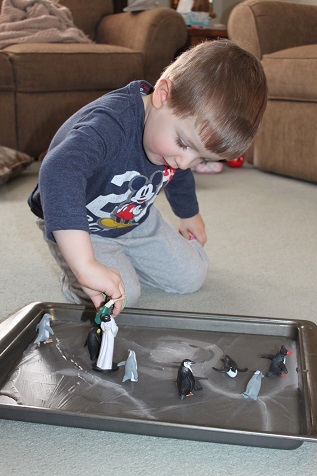 We propped up the ice and tested to see which toys would slide down the ice. We tried things other than the penguins, but I didn’t get a picture of that. 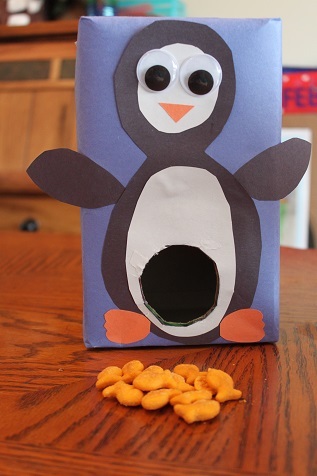 I made a penguin out of an oatmeal box and provided some fish. Hunter tried to throw the fish into the penguin’s belly. 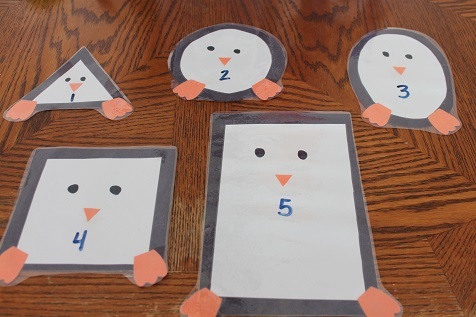 I made some shape penguins and laminated them. 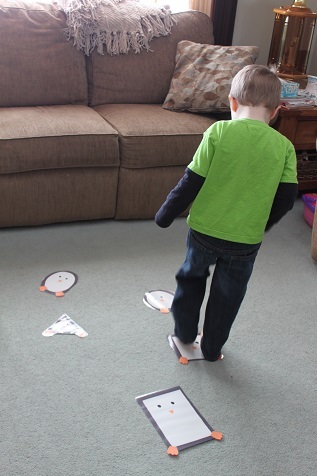 As I called out a shape, Hunter had to find it and stand on the correct shape. 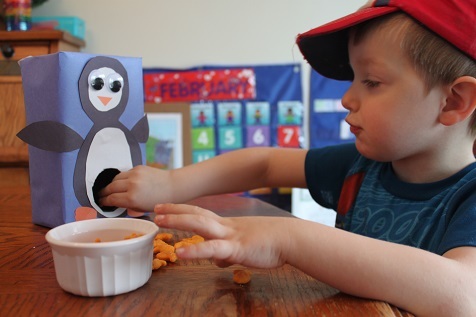 We counted out the appropriate number of fish and put them on the penguin with that number on it. 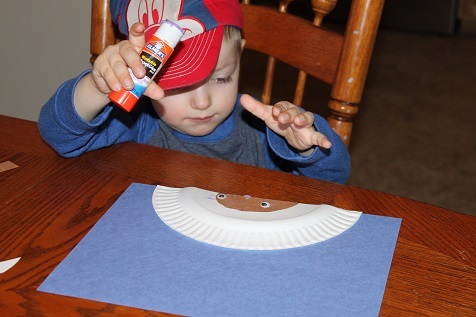 It was another week of fun here at Our Crafts N Things! 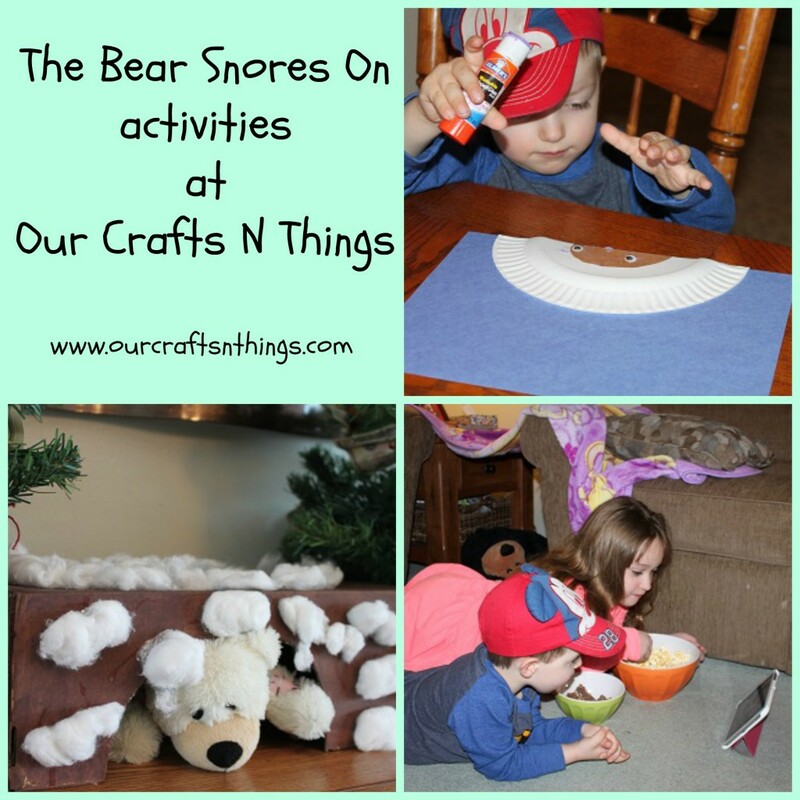 A fun book for winter time is The Bear Snores On by Karma Wilson. Hunter is very scared of bears, so I wasn’t sure if we should do this book or not. But, I decided to try it and see if it might help him not to be so scared of bears. He ended up loving this book! He asked to hear it over and over again. 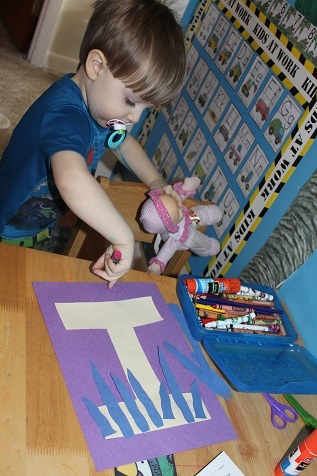 We made a picture of a bear in a cave. Hailey wanted to make one too. 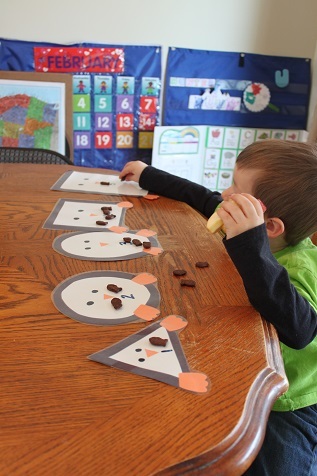 In the book the animals make a snack- so we did too. We had some popcorn and some yummy chocolate covered nuts. 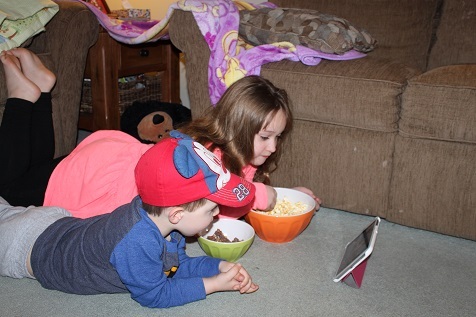 We found The Bear Snores On on YouTube, so Hailey and Hunter watched it while they ate their snack. 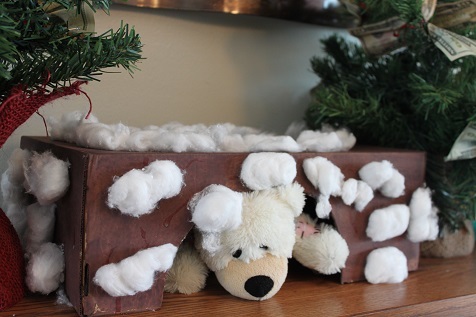 We made a bear cave. 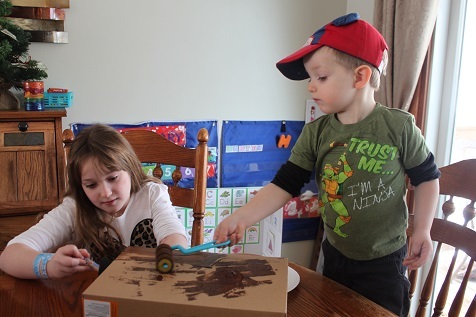 Hailey and Hunter painted a shoe box brown and then glued cotton on it. 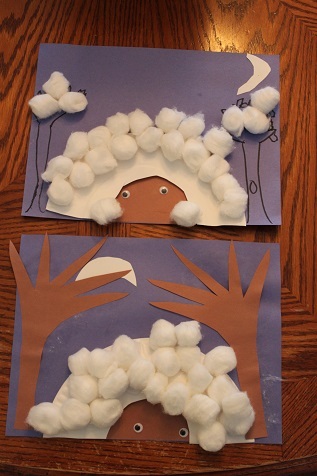 Hunter learned what hibernating means and put a bear in the cave so that he could hibernate. 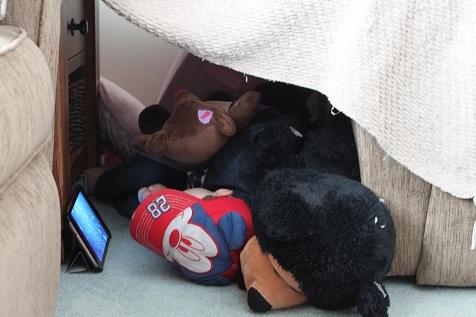 We made a bigger cave too using furniture and a blanket. Hunter liked hanging out in the cave throughout the week. He loved watching The Bear Snores On, so he gathered up some stuffed bears and took them into the cave to watch it with him. It was a fun week of activities! 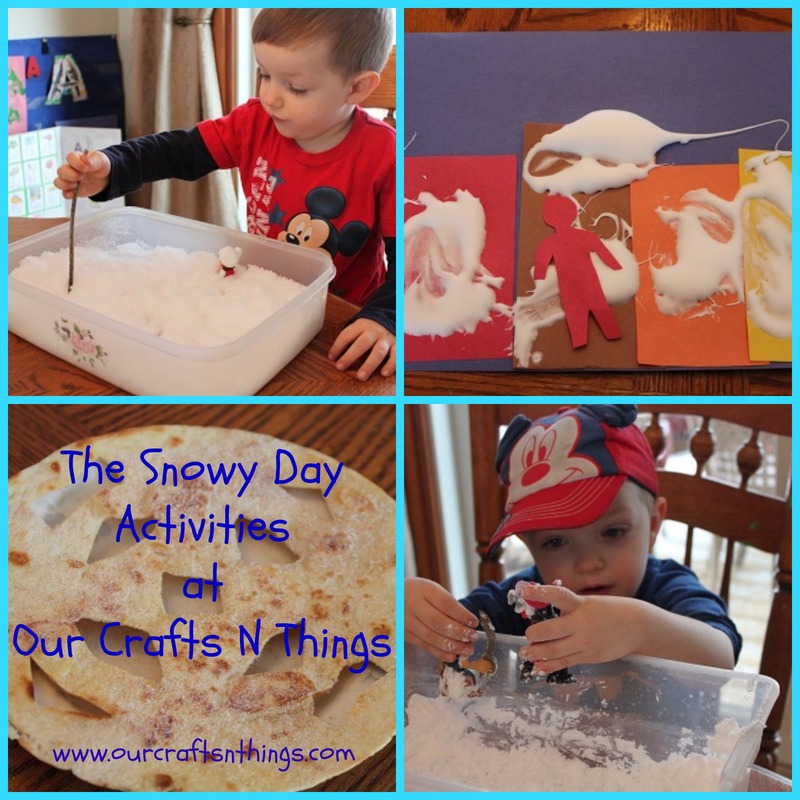 One of my favorite winter books is The Snowy Day by Ezra Jack Keats and we recently had a lot of fun doing a unit to go along with the book. Hunter loved the book too, and asked to read it every day. 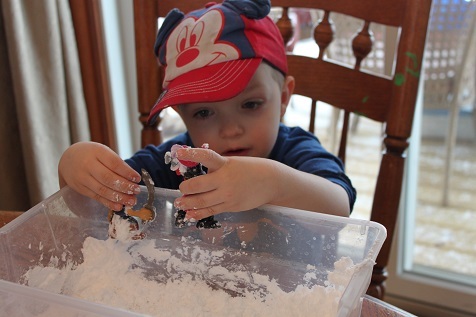 After we read the book, Hunter made his own snowy day scene. 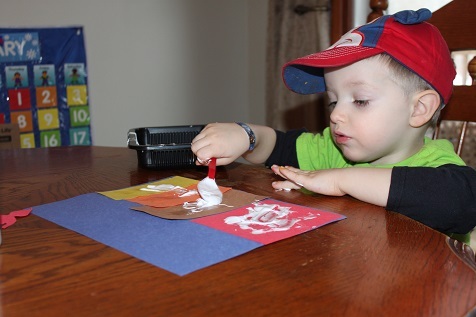 We mixed up some shaving cream and glue (equal parts) to make some puffy paint and then he added it to his scene. In the book, Peter sees the older boys having a snowball fight. 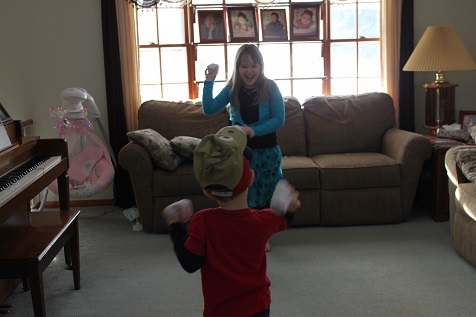 It has been super cold where we live, so Hailey and Hunter had an indoor snowball fight using socks. We also brought some snow inside. Hunter used a stick to make lines in the snow just like Peter did. 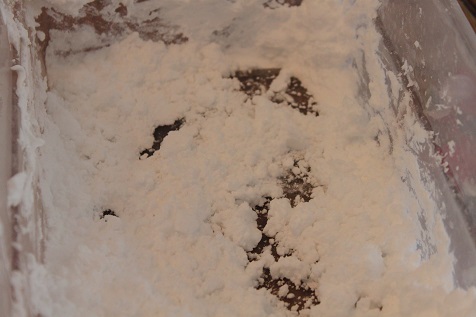 We kept the snow inside to see what would happen to it. 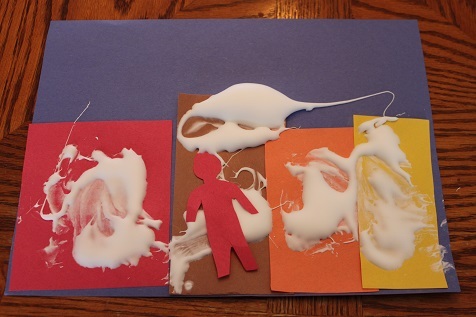 It melted, just like the snow in Peter’s pocket did. 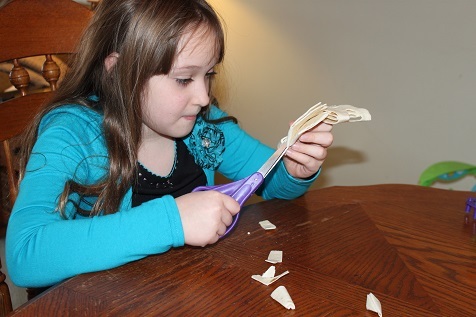 Then we made some delicious snowflakes. 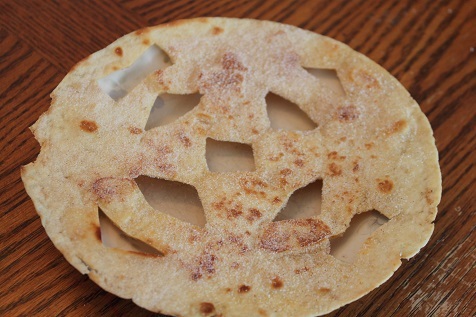 We cut tortilla shells to look like snowflakes. Then I fried them in butter and put cinnamon and sugar on them. They tasted so good that Hailey and Hunter requested to make them again when Rich came home from work. 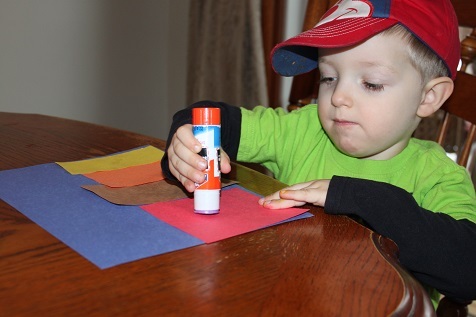 Hunter did this paper from Homeschool Creations about which clothes he would wear during winter and summer. Hunter had a great time playing with it. 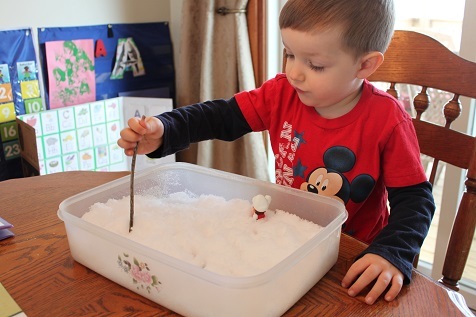 When he was all done using it, we poured some vinegar in it to watch the snow erupt. We had such a fun time doing this unit!! Hunter is 24 months old. 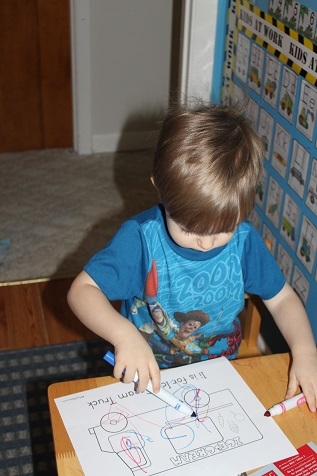 We took a couple of weeks off of Tot School for Christmas vacation and last week was our first week back to school. It was a crazy week though and we didn’t get a whole lot done. We had 2 snow days (when the public schools are closed for a snow day, we take the day off too!) and doctor’s appointments and just an overall crazy week. 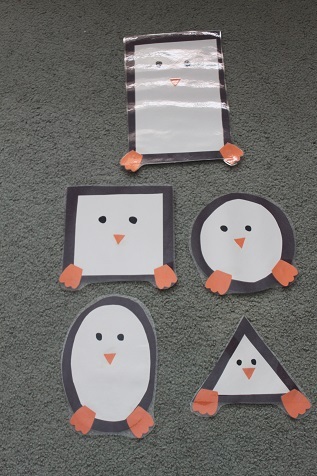 We started learning all about penguins. 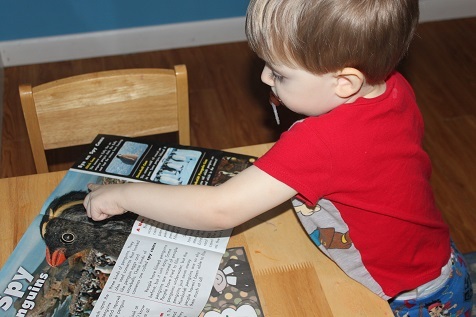 Hunter is looking over his Scholastic reader about penguins. Hunter’s letter this week was I. 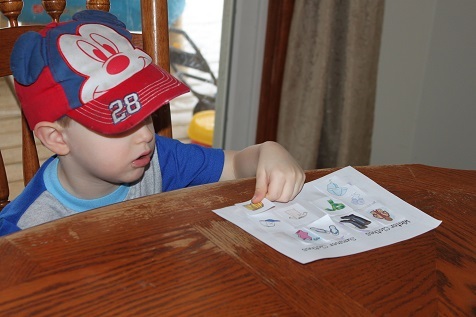 He used the printables from Royal Baloo and colored an ice cream truck. 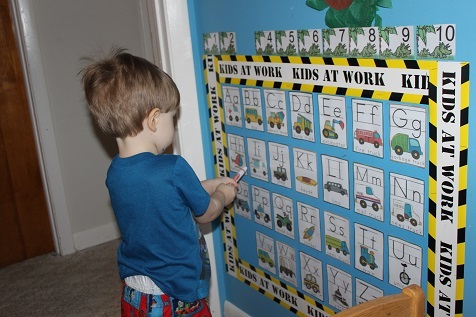 He found the letter I on his ABC wall. 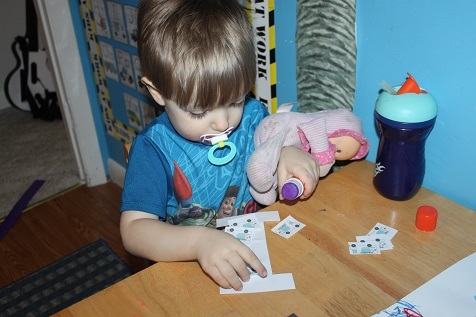 Hunter glued ice cream trucks onto the letter I. 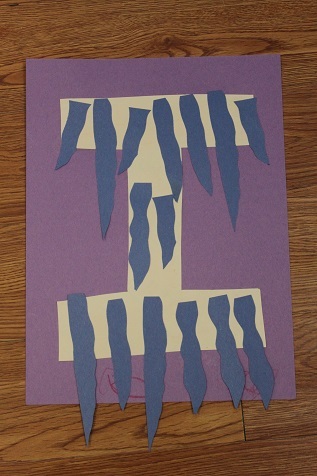 He also made an I is for Icicle. 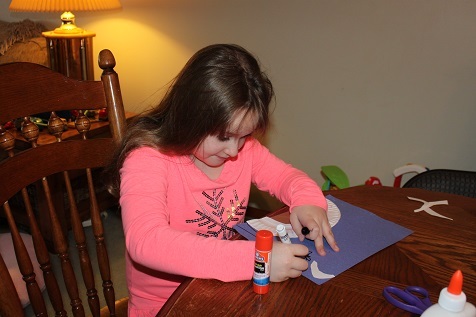 Hailey has the movie Frozen on her mind, and it was super freezing outside, so she thought of making the I is for icicle. The completed I for Icicle. 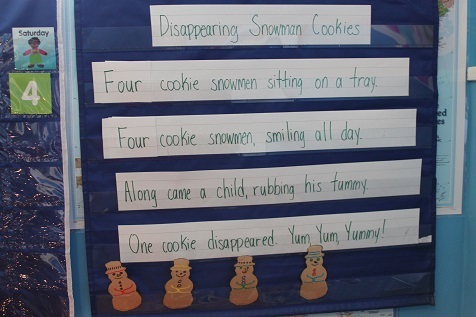 I thought Hunter would like this little Disappearing Snowman Cookies poem, but he wasn’t very interested in it. I’m hoping for a better, more regular week this week!